Actually there were men in the Royal Navy for at least four generations that I know about, culminating with my great uncle Arthur Thomas Muir. The most recent doctor, apart from those living, was my grandfather, Robert Douglas Muir. Before him there was a gx3 grandfather, Joseph Thomas, of Malta and Zante, friend and sometime doctor to Lord George Byron. I am not related to THE Thomas Muir, though I was always told I was! 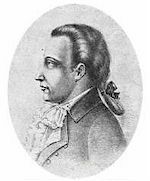 Click his image for my page about the genealogical problems associated with him, and his relation, or otherwise, to Muirs today. 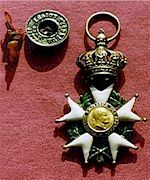 Right: all that remains of my great grandfather George William Muir's (his photo top left) Légion d'honneur which he was awarded by the French for his service as Captain Stephen Lushington's ADC in the Naval Brigade during the Russian (or Crimean) War of 1853 to 1856. As a result of this family connection I am now a keen student of the whole Victorian era of naval history and, more specifically, I am a member of the Crimean War Research Society. I am making a particular study of all the officers known to have served ashore with the Naval Brigade in the Crimea. A list of their names appears at the bottom of the main Family History page. If you are related to any of them, and are not already in touch with me, I would love to hear from you. Was the Thomas Muir who made this clock my gx4 grandfather? Well, he might have been, but it looks increasingly unlikely. My gx3 grandfather, George Muir, was recorded in several RN musters as being born sometime between 1774 and 1776 in Dunfermline; once simply in Fifeshire; and once in Duncaster - an old spelling of Doncaster. Thomas and Katherine Muir (née Doig) got married in Dundee on 22 February, 1763, before moving to London and setting up business there sometime before May, 1764. They then proceeded to have at least four children (four baptisms recorded) in the Finsbury area, culminating with a George Muir, baptised on 07 August, 1774. It looks very likely that both this George's parents died when he was very young. His older sister and two older brothers may well have all died young, as they can't be identified for certain except in their baptismal records, leaving the young George alone. Could it be that George knew his parents came from Scotland, and thought that he had been born there too...? Dundee, Dunfermline, Angus and Fifeshire themselves, are close together on the East coast, after all. Duncaster could simply have been a clerical error for Dundee or Dunfermline - simply miss-heard or read by the Clerk filling in the muster. And when it was passed down in family mythology that we were descended from Thomas Muir — was Thomas Muir the Clockmaker the original source, not Thomas Muir of Huntershill? But I am in contact with someone who has a George Muir in their ancestry, it it is almost certain it is Finsbury George. Please see George Muir Senior, page one for more about this. 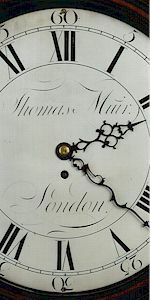 I would be very pleased to hear from anyone who knows anything more about Thomas and Katherine Muir's clockmaking activities in London. There appears to be very little on record. (My contact details are described on the main Family History page. "Mille millions de mille sabords...!" Albion, Franconia & the Despotate of Epirus. thomas-muir.com is owned by Thomas Muir.